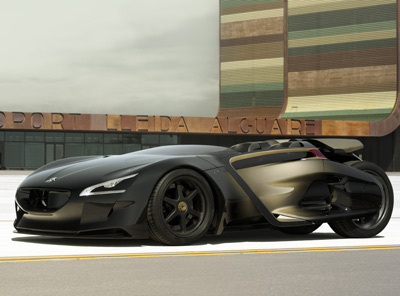 The Peugeot EX1 concept is a 100 percent electric-powered concept car. The vehicle was introduced at the Paris Motor Show in 2010. 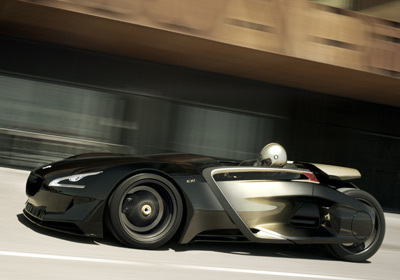 The sporty Peugeot EX1 has already broken several world records for acceleration from a standing start. It owes its startling performance to its streamlined aerodynamics, its ultra-light structure and its two electric motors. Unlike many electric vehicles which sacrifice performance for range, the Peugeot EX1 is all about speed - as its 340 hp, and four-wheel drive setup prove. 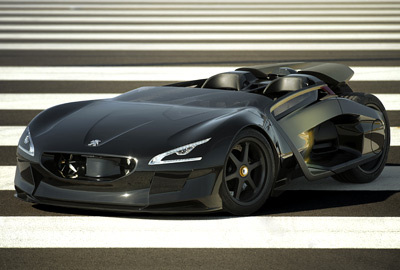 The Peugeot EX1 concept was created as part of the company's celebrations for their 200th anniversary. Obviously such a long history requires an unusual vehicle to do it justice, and the EX1 is just about odd enough to qualify. 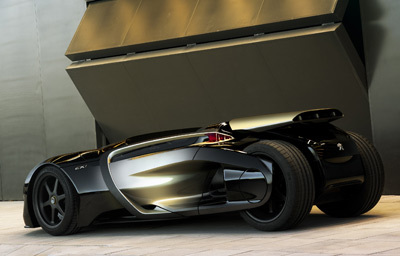 To this end, Peugeot's engineers and designers explored the company's history to find the most radical technical solutions to use as a basis to produce a futuristic performance car dedicated entirely to creating new driving sensations yet at the same time presenting responsible environmental credentials. The original architecture is reminiscent of previous concept cars, like the Asphalte and 20Cup. 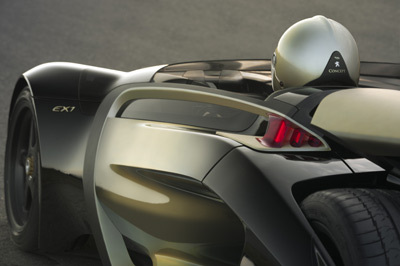 The unusual styling of the two-seat Peugeot EX1 roadster is in keeping with its mechanical design, like a kind of "exoskeleton" highlighting the light-weight nature that guided the car's creation. 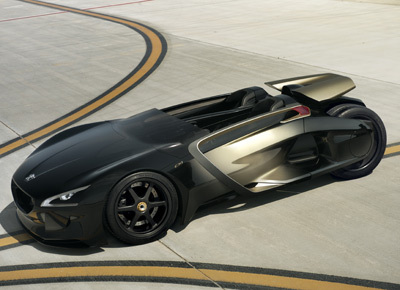 The design of the body incorporates Peugeot's new stylistic design codes, first seen on the SR1 concept car earlier this year, with its "floating" front grille and flowing contours. Polished aluminium components adorn the door surrounds in a reference to the RCZ and BB1. 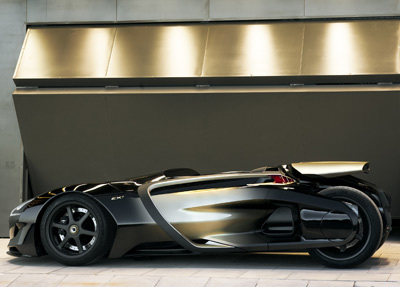 Far from being a �classic� roadster, the EX1 concept car is based on an architecture shaped like a �water droplet�, with a rear section built around two closely set rear wheels. 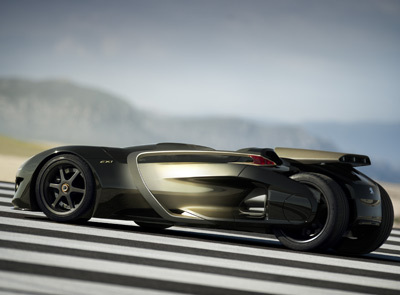 Based on the experience gained from creating the 1996 Asphalte concept car and the two 20Cup models from 2005. The chosen architecture of the EX1 has enabled the size of the passenger compartment to be reduced for optimal weight distribution and ensure that there is no extra weight at all in the overhangs. The suspension employs a number of technical solutions that ensure road holding of a very high level. The front suspension consists of a drop link double wishbone arrangement. The rear suspension comprises of a single �swinging arm� linked to a centrally mounted shock absorber which is connected via a rocker arm to provide a variable damping rate. 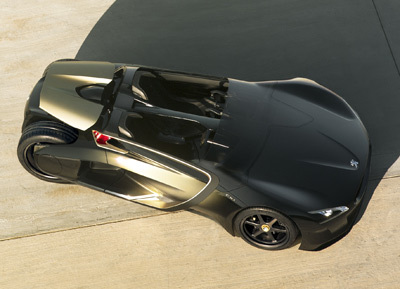 The monocoque body structure is manufactured from a carbon/honeycomb composite to optimize weight and rigidity. It also incorporates all of the mounting points for the car�s mechanical components. Finally, the dimensions of the car (0.90 m high with a width of 1.77 m) contribute to overall efficiency, a lowering of the centre of gravity and improved aerodynamics. The electric motor is a potential source of new driving sensations thanks to its exceptional acceleration capabilities, but also because it is silent in operation and makes the car very easy to drive (no need for a gearbox). 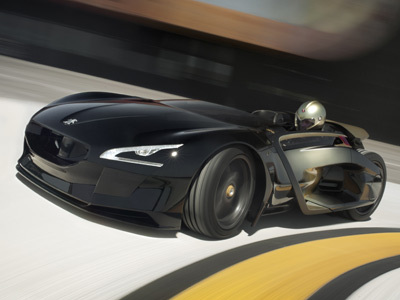 On the Peugeot EX1 concept car, two electric motors are used, one on each axle, each with a peak output of 125 kW (250 kW / 340 bhp in total), and an immediately available constant maximum torque of 240 Nm at the front and rear. This mechanical architecture allows not only the optimization of weight distribution, but also four wheel drive. The driver and passenger climb into the passenger compartment through a reverse-opening door, giving access to the two sports bucket seats. This unusual arrangement instantly immerses the occupants in a futuristic and sophisticated environment, as does the onboard instrumentation (instrument panel screens for each occupant showing in particular the vehicle�s instantaneous performance) and the chosen materials (e.g. �pure� metals and embossed leather). The driver, seated at floor level in a driving position that helps enhances the sense of excitement (legs outstretched), drives the vehicle with two control handles, providing an experience similar to that of an aircraft pilot or video game. As well as the presence of harnesses inside the car, the occupants are also protected by the height of the carbon passenger cell, which has sufficient overhead clearance to include a roll-over protection bar. 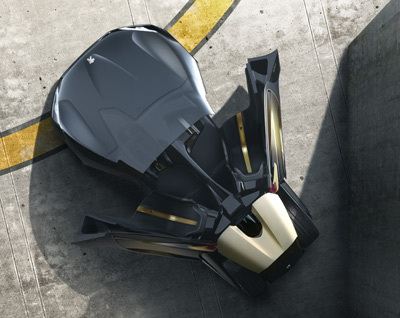 The EX1 concept car benefits from characteristics that give it a high enough level of performance not only to leave behind the city centre, the preferred territory of electric vehicles, but also to challenge acceleration records. Its lightness, weight distribution and aerodynamics, the torque and power of its two electric motors and its high-output lithium-ion battery are just some of the characteristics that make this a car capable of lightning acceleration: the latter can exceed 1 G of gravitational force.